If you're shopping for someone who spends a lot of time traveling - whether for business or leisure - there are a lot of great gift ideas to consider. As LoveToKnow's travel editor (and a frequent business and leisure traveler), I received a variety of items designed with the needs of travel enthusiasts in mind to review. I am excited to share some of my favorites. Ogio makes a great selection of must-have bags perfect for transporting your laptop and tablet that have additional pockets and compartments for other travel items that you need to keep close by, such as a cell phone, earbuds, bottled water, your wallet, a small purse and more. The Hampton's Women's tote pictured here is a great option for women who like handled bags, and Ogio also makes a nice selection of laptop backpacks. 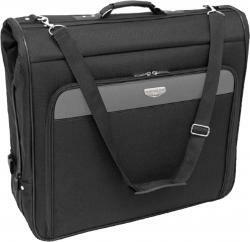 The Hampton's style has a pocket that holds laptops up to 15" and backpacks come in styles to fit 15" or 17" laptops. All of the bags are very well-made and can be used as personal item carry-ons for air travel or as handy totes to keep close at hand in the car or when traveling via other means. Available directly from Ogio for between $70 and $150; the bag pictured above costs $70. The Travelon Mini Independence Bag is a great tool for keeping cosmetics and toiletries organized during travel - and you can also use it at home to reduce clutter on your bathroom counter. 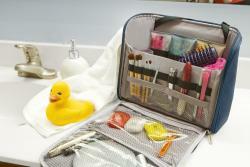 The bag is a hanging cosmetics organizer that folds to become a zipped travel case for easy packing. It includes a shelf compartment to hold larger items like hair care products and tubes of cleanser or moisturizer and small pouches - including two that zip - for smaller items. The bag is available from BoomShop.com for under $50. If you're shopping for a frequent flier, Travelon's 1-Quart Zip-Top Bag With Plastic Bottles is a good option. You may want to combine it with the Mini Independence Bag (as it will tuck away inside the shelf compartment) or give this item on its own if you are looking to spend less than $10. It is a clear plastic zip-top pouch that can be carried on an airplane. 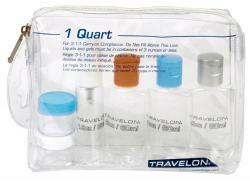 The pouch comes with six refillable small containers, right-sized to meet TSA's 3-1-1 requirement for liquids. This bag is available from BoomShop.com for $9. 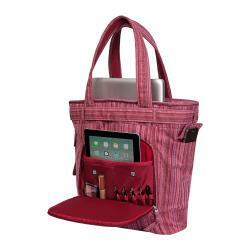 The Tech TravelTote from Zo & Co is another item that frequent fliers are sure to enjoy. This unique tote is designed to slide over the back pocket in front of you, where it stays securely in place and holds items that you might need in-flight so you don't have to navigate in and out of bags stored under the seat or in the overhead compartment. It has four roomy pockets and a carabiner clip, and folds neatly for storage in your personal item carry-on or other bag. Even though this tote is quite small, you can place quite a few items in it, including a tablet, cell phone, water bottle, ear buds, snacks, pen, stylus and more. This made-in-the-USA item is available from American Certified for under $30. A hanging garment bag, such as this sturdy yet affordable Travelers Club Garment Bag, is a great gift idea for people who prefer not to fold their clothing into a suitcase for travel. It's a great choice for those who travel with dressy attire or business clothes, as well as for RV campers (as it's easier to find a spot in an RV to hang a garment bag than to stash away a suitcase). This item has interior pockets for shoes and accessories, a hanger clip that locks to keep clothes securely in place, a sturdy top handle and dual hooks for hanging. The shoulder strap can be removed and the zippers are self-repairing. This bag is available under $40 from Wayfair. If you are shopping for someone who travels by car or truck, a universal cell phone dock that can be mounted on a windshield or dashboard is a great gift idea to consider. 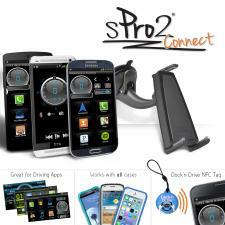 The iBolt SPro2, which works with most smartphone models in their cases, is a good option that meets the needs of those who travel long distances on the road (though it is also handy for daily driving as well). As soon as you connect your phone to the dock, the iBolt Dock'n Drive app will launch automatically, displaying a home customizable home interface that by default displays large buttons for compass, clock, speedometer and media control functions. The device's design allows you to keep charging and audio cables in place during use. Order directly from iBolt for just under $25. On-the-go entertainment is a great gift idea for travelers, and that's exactly what you'll be providing when you give a subscription to Scribd. For just $8.99 per month, you can provide the frequent travelers on your shopping list with access 24/7 access (via connected devices) to over half a million eBooks and 30,000 audiobooks from top publishers and authors. While you do have to be online to select books via the Scribd app, you don't have to be connected to the Internet to read or listen. Access to items in the Scribd library (which is constantly growing) is unlimited - everything is included for the flat subscription fee. 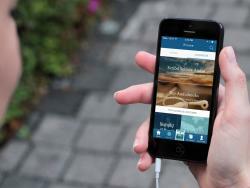 Visit Scribd.com to purchase a subscription. Travelers who use a tablet when they are on the go are sure to fall in love with Octa's MonkeyTail. This tablet accessory functions as a flexible stand, lifting the device to eye level. One end connects to your tablet via a suction cup, and the other can be coiled to form a flat stand or wrapped around an armrest - such as on airplane, train, bus or chair. It brings your tablet up to eye level for hands-free reading, and can be rotated for perfect positioning. Purchase directly from Octa for around $40. Even though travel can be enjoyable, it can also be quite stressful. Further, it's difficult to finding time to relax and unwind during travel. 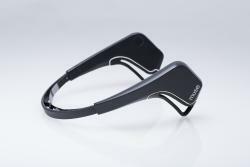 Muse is a tech-oriented wearable designed to help users improve their "mental and emotional fitness." Muse is easy to pack and use on the road (as well as at home). It works in conjunction with a smartphone or tablet, functioning like a heart monitor - but for your brain. It detects brain signals as you complete a "focused-attention exercise" designed to help you become more composed, focused, calm and relaxed. Progress can be tracked via a private app (the Calm app) and you can benefit from using Muse for as little as three minutes per day. Order for under $300 from Gaiam. Keeping electronic devices charged while on the road is something travelers often find challenging, as is Internet access. The Satechi Smart Travel Router is a great solution - even for those who travel internationally. It serves double duty as a router and USB charging station that can charge two USB devices simultaneously. It has typical router functionality, but also allows you to amplify existing Wi-Fi (a great feature for hotels where the signal is weak), create a Wi-Fi access point from a wired connection and more. Because of its multiple plug configurations, the device can be used in 150 countries. Its small size (2" x 1 ½") makes it easy to tuck away in your luggage or purse. Order online for around $50. One of the challenges of travel is finding a convenient way to carry necessities like money, credit cards, travel documents and identification so that they are close by and easy to reach, yet out of the way. The combination of a BeltaPouch and a Beltaway belt makes it easy to carry these documents close to you. The pouch slides over the belt and the belt fits around the waist with the pouch in place. It securely holds important flat items tucked away beneath whatever you are wearing. It is a particularly great solution to use when sightseeing if you don't want to have to carry a purse. Order online; the pouch costs just under $17 and the belts, which come in two widths, are around $20 each. If you're shopping for a traveler who is always wondering where her cell phone is, PhoneFetcher is a great accessory to consider for a gift. 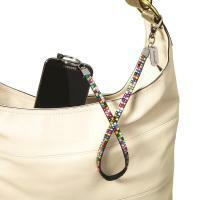 This device allows you to tether your phone to a bag (such as a purse, backpack, tote bag, etc.) or your person (via a belt loop). One end of the cable plugs into a standard cell phone audio jack and the other clips to whatever item you want to connect to your phone. Using this device can help you keep track of your phone inside your travel bag, as well as help prevent you from leaving it on an airplane, car, bus or train. It comes in several styles, including a bungee-style sport model, a chain in your choice of metal finishes and blingy bejeweled designs. Order online for less than $20. Temperatures can be unpredictable when you're traveling, so it's always a good idea to have an easy-on, easy-off cardigan handy when you are on the road. BLOOM's Raw Edge Yoga Cardigan is a great option for travelers, and it makes a terrific gift. It is much more stylish than a sweatshirt, and it takes up less room in your luggage. This garment can be rolled up and stuffed into your backpack or carry-on, yet still look great when you put it on. This item comes in sizes S-XL, and it runs true to size. It is available at Sports Authority for $60. 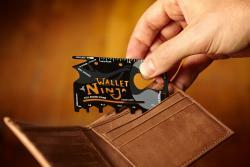 The Wallet Ninja is a nifty wallet-size item that can come in very handy on the road. It is a flat, stainless steel multi-tool the size of a credit card that can be carried on airplanes. Even though the gadget is tiny, it has 18 useful tools, including edges that function as screw drivers, a box cutter and a letter opener, hex wrenches, a fruit peeler, bottle and can openers and more. Order online from walletninja.com or purchase from select retailers including Walmart and The Home Depot for around $10. When you select a travel-oriented gift, the frequent travelers on your shopping list will know that you put thought into your selection, taking care to choose an item that matches their interests. These are only a few of the many items they may enjoy. From travel clothing to portable waterproof speakers, there are many more options you might want to consider. Note: The writer received samples of the items reviewed in this article at no cost. The decision on which items to include was based solely on the writer's opinion and experience as a frequent business and leisure traveler.